Pianists have long turned to the renowned Hanon exercises as the best way to develop smooth chops, articulation in melodic phrasing & dynamic expressive ability. Hanon Power Workouts by Larry McCabe published by Santorella Publications, transcribed and edited for Violin & Fiddle will enable violinists and fiddlers to acquire the technical edge that Hanon pianists have enjoyed for many years. Whether you are a beginner, seasoned pro or any other level in between, you will benefit greatly from this Santorella Publication by adding these workouts to your daily practice routine. The sometimes tedious Hanon exercises, written in standard notation in appropriate keys for fiddler’s, will give you super technique and loads of new melodic ideas for lead playing and composing. You will notice a difference, and so will your friends and fans. 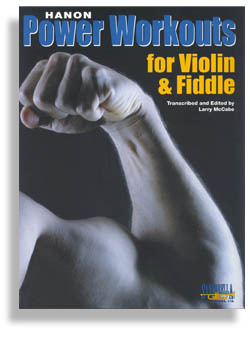 Hanon’s Power Workouts is the perfect addition to any violinist’s practice routine.